1. From any of the four watches, click on “Practice” in the toolbar to bring up a Practice session for that whatch. 2. Whacky Whatch picks a random time. 3. 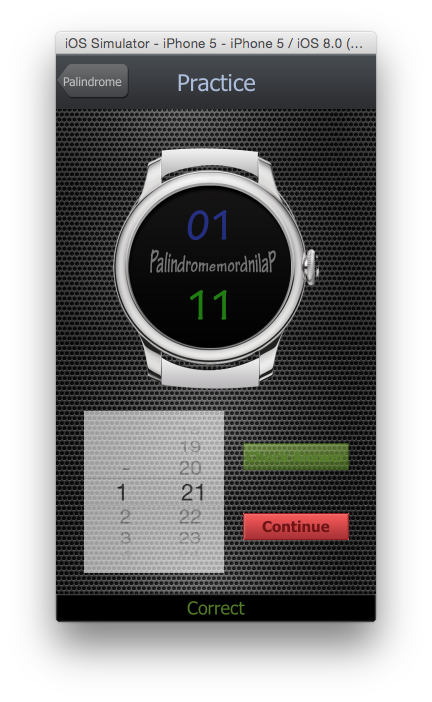 Use the wheel and buttons to enter the time. The status bar at the bottom will tell. you if you are correct and, if not, will display the proper time. 4. Swipe left or right to practice on any of the 4 whatches. 5. Return to normal time telling by tapping the whatch name in the title bar.